Anniversary of the Accession of. Queen Elizabeth II 1977 Silver Jubilee. 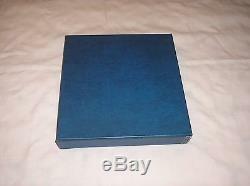 The Lindner binder, hingeless pages and slipcase were made in Germany. 59 Total Pages from front to back including the blue front and back covers, and the hingeless page cover with large stamp image of Great Britain 8½p from 1977 set. 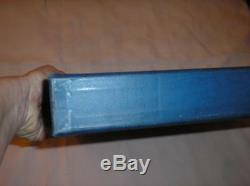 The slipcase shows some wear around the corners with scotch tape. 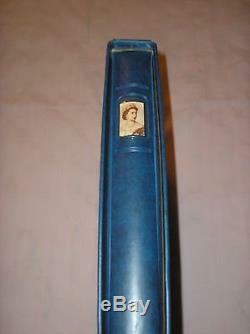 Measurements: Binder 12¼x11½; Slipcase 12¾x12. 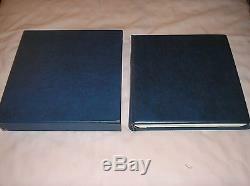 Custom blue LINDNER binder, slipcase, and hingeless pages, The QEII Silver Jubilee Collection, cover page, MNH stamps in singles and sets, souvenir sheets, sheetlets and/or complete booklets from the following countries. 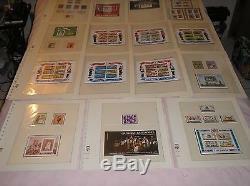 Great Britain set of 5 stamps. Guernsey set of 2 stamps. Jersey set of 3 stamps. Isle of Man set of 3 stamps. Gibraltar set of 2 stamps and 1 souvenir sheet of 2 stamps. Ascension Island set of 3 stamps. Botswana set of 3 stamps. The Gambia set of 3 stamps. The Gambia souvenir sheet of 4 different stamps with D10 value each. Mauritius set of 3 stamps. Helena set of 3 stamps. Swaziland set of 3 stamps. Tristan da Cunha set of 3 stamps. Anguilla set of 4 stamps and 1 souvenir sheet of 4 stamps. Antigua set of 5 stamps and 1 souvenir sheet of 1 stamp. Bahamas set of 4 stamps and 1 souvenir sheet of 4 stamps. Barbados set of 3 stamps. Bermuda set of 3 stamps. Belize set of 3 stamps. Barbuda souvenir sheet of 6 stamps. Barbuda 75c sheetlet of 9 stamps and 6 labels + strip of 3 stamps with 3 labels. Cayman Islands set of 3 stamps. Montserrat set of 3 stamps. Christopher-Nevis-Anguilla set of 3 stamps. Dominica set of 5 stamps and 1 souvenir sheet of 1 stamp. 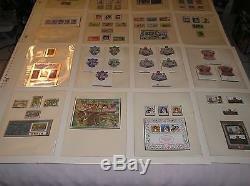 Dominica set of 5 stamps with. Grenada set of 5 stamps and 1 souvenir sheet of 1 stamp. Grenada Grenadines set of 3 stamps and 1 souvenir sheet of 1 stamp. Lucia set of 4 stamps and 1 souvenir sheet of 1 stamp. 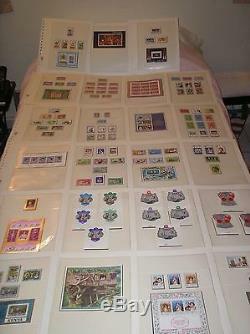 Vincent set of 12 stamps. Vincent souvenir sheet of 12 stamps. Vincent set of 3 stamps. Turks & Caicos Islands set of 3 stamps. British Virgin Islands set of 3 stamps. British Antarctic Territory set of 3 stamps. Falkland Islands set of 3 stamps. South Georgia set of 3 stamps. Australia set of 2 stamps. Fiji set of 3 stamps. Gilbert Islands set of 3 stamps. Cook Islands souvenir sheet of 6 stamps. Papua New Guinea set of 3 stamps. New Hebrides Condominium (English) set of 3 stamps. New Hebrides Condominium (French) set of 3 stamps. Pitcairn Islands set of 3 stamps. New Zealand souvenir sheet of 5 stamps. Solomon Islands set of 3 stamps. Samoa I Sisifo set of 4 stamps. Hong Kong set of 3 stamps. Republic of Maldives set of 6 stamps and 1 souvenir sheet of 1 stamp. Brunei set of 3 stamps. Republique du Mali set of 2 stamps. Republique Togolaise (Togo) single stamp with silver foil border and 1 souvenir sheet of 1 stamp + 4 labels (top, bottom, left and right sides) with silver foil borders. 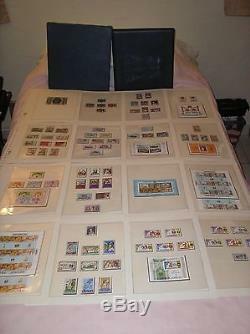 Tonga complete set of 13 numbered stamps including 10 regular and 3 airmails. Kenya set of 4 stamps and 1 Royal Visit 1972 souvenir sheet of 1 stamp. Kenya Treetops souvenir sheet of 1 stamp. Souvenir sheet border inscription: For the first time in the history of the world, a young girl climbed into treetops one day a princess and she climbed down from the tree the next day a queen God Bless Her. Bangladesh set of 3 stamps and 1 souvenir sheet of 3 stamps. Niue set of 3 stamps and 1 souvenir sheet of 2 stamps. Liberia set of 3 stamps and 1 souvenir sheet of 1 stamp. Republique du Tchad single stamp and CTO souvenir sheet of 1 stamp. Sierra Leone set of 2 stamps. Seychelles set of 8 stamps. Seychelles souvenir sheet of 4 stamps. Grenada Grenadines set of 3 sheetlets of 3 stamps + 1 label each with silver borders. Turks & Caicos Islands Royal Visit 1966 souvenir sheet of 1 stamp. Republique de Haute-Volta (Burkina Faso) set of 2 imperf souvenir sheets of 1 stamp each. Republic of Maldives set of 6 sheetlets of 5 stamps + 1 label each. Republique Populaire du Congo set of 2 stamps and 1 souvenir sheet of 1 stamp. Republique de Haute-Volta (Burkina Faso) set of 2 stamps and 1 souvenir sheet of 1 stamp. VERY RARE & HARD TO FIND!! Tanzania set of 4 stamps and 1 souvenir sheet of 4 stamps. MNH = Mint Never Hinged. CTO = Cancel To Order. The item "QUEEN ELIZABETH II 25th Anniversary Accession 1977 Silver Jubilee Stamp Album QE" is in sale since Saturday, February 20, 2016. 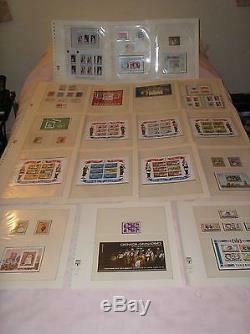 This item is in the category "Stamps\Topical Stamps\Royalty". 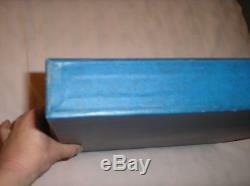 The seller is "autumnmeadow" and is located in Miami, Florida. This item can be shipped to United States, to Canada.